PSB Image B5 review | What Hi-Fi? 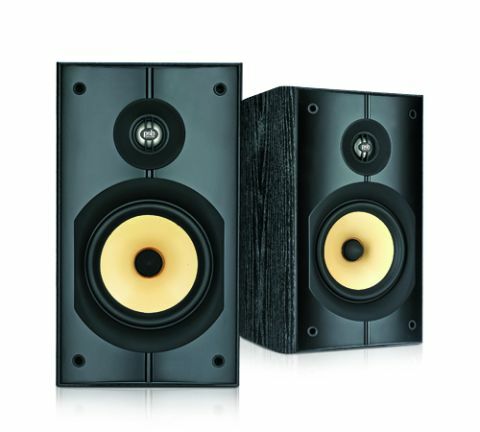 These bookshelf speakers from Canadian manufacturers PSB have previously been featured as part of a one-make systems test back in our January 2012 issue, but now it’s time to let these Image B5s step into the limelight. The PSB Image B5 bookshelf speakers are a compact pair available in black ash or dark cherry finishes, with a curved cabinet breaking the mould of more conventional straight-boxed speakers. It’s worth keeping the grilles off to show off the 25mm titanium dome tweeter and the 13cm clay/ceramic reinforced polypropylene mid/bass driver, with the yellow cone contrasting nicely against the black finish of the front panel. Straight out of the box, the Image B5s catch our attention – the sound is clear and lively, albeit with a sharp edge to the top end. These Image B5s need at least a night’s running in, particularly to tame that rather bright and hard treble. And while the treble’s initial brightness mellows down to faint shimmer, the hardness persists. There are ways to tweak the sound to a more even balance: firstly, bi-wiring is essential as it adds a touch more weight and organisation to the sound. Also, unusually for bookshelf speakers, you can take advantage of that rear port design and position these Image B5s close to the wall – this extra boost to the bass is certainly welcome. While it won’t change the character of that hard treble, it will give just a bit of warmth and roundedness to the bass that will even up the balance. The sound they produce is also remarkably clear, with edges that are scrubbed clean to deliver taut and controlled notes – but this stark clarity can rob the fine subtlety and harmonies that give that extra bit of insight and emotion to songs. The hard and polished edge means that they will favour certain music styles over others: the subtle progression of Arvo Part’s Fratres may not be the natural choice for the PSBs, but Radiohead’s 15 Step and The Social Network OST are delivered with plenty of attack and bite. Play Amanda Palmer’s Runs in the Family and the Image B5s deliver the hard-hitting drums and insistent piano notes with a good deal of punch and agility; they're less expressive with the emotions in her vocals. There’s a good amount of detail on offer, along with plenty of snappy timing and good dynamics. They may not fill up a room as fluidly and openly as the Mission MX2s or the Wharfedale Diamond 121, but these Image B5s are a lively and exciting listen. Despite the hard quality, they’re a preferable and more enjoyable listen than the Epos Epic 1s. All in all, these PSBs make quite an impression, and are talented enough to earn a 4-star rating with such an attractive price amongst long-standing and class-leading contenders.